We will collect your pet as soon as possible if that is what you want. Some sample fees are shown below. If you do not mind your pet being left at the veterinary surgery then in order to minimize the cost to you we offer a free collection from certain veterinary practices on a twice weekly basis. For an individual cremation, if we collect on one of our normal days we will return the ashes on the next. This means there will be a maximum of one week from the time your pet dies to the time the ashes are returned to the surgery for you to collect. For other surgeries near to our normal collection routes we can also collect on these days if your vet is happy to allow this. There will be a cost depending on the distance and time to get there but it will be considerably reduced from the normal single collection fee. We work closely with our partner vets to ensure your pet is stored sympathetically and this is helped by the frequency of our collections which reduce the number of pets having to be kept at the surgeries. However, other vets may not have these facilities and systems and you may which to check exactly how they are to be stored. For single collections we will normally use one of the smaller vehicles, either a four-wheel drive or car. Pets are placed into a container lined with a white film to make the removal of the pet at the crematorium as easy as possible. 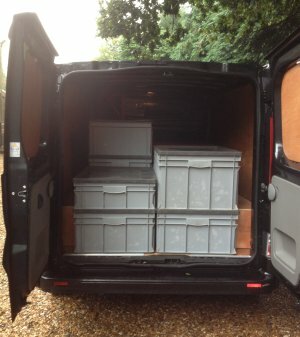 ry collections pets are carefully placed side by side into containers within a van. We never pile one pet on top of another and we always follow our first golden rule that we handle your pets as if you were next to us at all times. Only pets are collected and we do not handle any form of waste. This is one of the main factors which differentiates us from the normal commercial services that so many veterinary surgeries use. Your respectful cremation service starts from the moment we collect your pet – something that simply does not happen for most of the so-called cremation services that veterinary surgeries employ. Ultimately you decide how you want us to collect your pet. We are here to follow your wishes so please feel free to discuss any aspect of the service. You may bring you pet to us at anytime during normal working hours. An appointment must always be made. The cremation will be carried out as soon as possible and the ashes will normally be ready for collection within 24-48 hours. If you wish to have an Individual cremation carried out immediately, with the ashes available to take home later the same day please contact us in advance to make arrangements. The additional fee for this scheduled service is £52. The process can take between 2 & 6 hours depending on the type of pet. If you wish we can collect your pet from your home. Sample fees are shown below. We will collect at a mutually convenient time, which will always be as soon as we possibly can. Obviously, the more notice you can give us then we can be more accurate in our timings but just call us when you need us and we will respond as soon as we can. We can also collect from your home on our scheduled run days and this will reduce the cost significantly, depending, of course, on the location. Your pet will be placed into its own container and transported with other pets using the same system described above in the veterinary collections. Again, the choice is yours. This is a guide price only. Please call us with your postal code for an accurate quote. We can also collect from your home on our scheduled run days and this may reduce the cost significantly as we may be passing nearer your area. Your pet will be placed into its own container and transported with other pets using the same system described above in the veterinary collections. Again, the choice is yours.